Sea creatures seem to be natural choices when the manufacturers of tea-infusers are looking for a new shape. After all, sea creatures spend their time in the water – why shouldn’t they spend some time in your tea? This Octeapus Tea Infuser from Fred is a great example, and one with a punny name, as well. 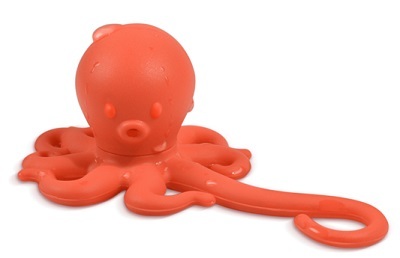 The silicone infuser looks like an octopus, complete with wiggly tentacles and a bulbous head. The head pops off to reveal a cavity where you can pack your loose-leaf tea inside. The Octeapus is 4 inches wide 1.5 inches tall, large enough that it won’t get lost in extra large mugs and can still fit inside a more traditional teacup. For large mug users, it has a hook at the end of its longest tentacle that you can loop over the edge of your mug to secure the infuser in place, so you won’t have to go fishing for it in your hot tea when you’re ready to drink.